A few years ago we visited Mammoth Caves with Jake's cub scout troop and my eyes caught the National Park Passports in the gift shop. I purchased two for the boys, we had them quickly stamped and that was it. I didn't realize then how much we would enjoy them and also they changed the way we travel. You can purchase the passports at any National Park Site or online HERE. They are about $10 each. There is a kids version and an adult version. I bought my kids the adult version and the reason is that I want this to be a lifelong collection and not just through their childhood. I am so glad I decided to go with the adult passport book because I know Jake would have already outgrown the kids one. With the passport comes a map with all the National Parks/ Sites/ Monuments etc. in the country. Every time we travel we check the map to see if there is something at out destination or along the way we can visit. Many times have we made a pit stop on a long road trip at a place we would have never thought to visit and it turned out to be amazing. For example on our way down to Florida last winter we tried to break up the drive and visited the Ebenezer Church in Atlanta and we all loved it so much we still talk about that stop. There are also a bunch of great apps to use to find the nearest parks, get some information and to collect online badges. I like to use the National Parks app by Chimani for my iPhone but I know there is also a really great one from National Geographic. As of right now we have collected 22 stamps over the past 4-5 years! We have stamps from places like Grand Canyon, Zion, Everglades, Smokey Mountains, Mammoth Cave, Hopewell Culture, Cuyahoga Valley and many more. You can also purchase actual stamps at the sites and collect these as well in your passports we decided against it and instead take a picture of the boys in front of the sign and tape that in the book! Another great thing about our National Parks are the Junior Ranger Programs. 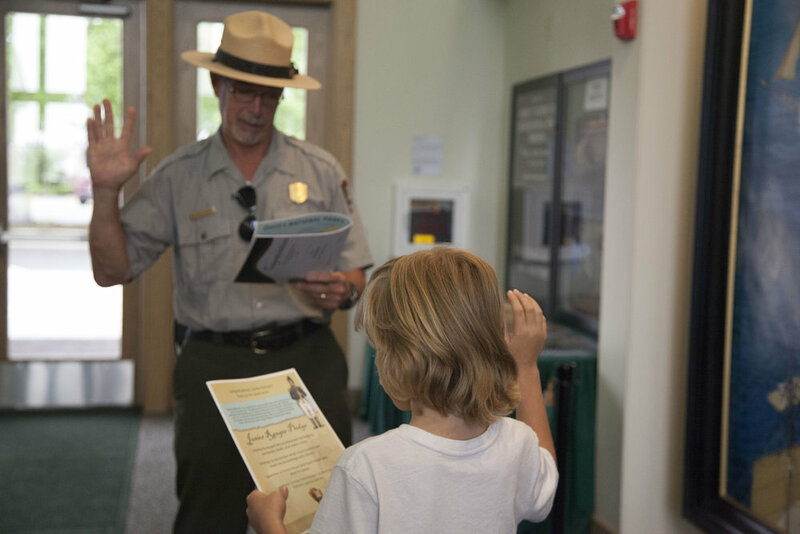 Each park has a Junior Ranger Program which is a little booklet filled with activities. Some are very easy (like the one above), some include a Scavenger Hunt and we even had one that asked for you to pick up trash around the park! They are mostly free, the only one we have come across that you had to pay for was the one in the Smokey Mountains. The activities are all age appropriate and usually the older you are the more activities you have to do. Once you are done with your booklet a ranger will check it with you and may ask you some questions about your answers. Once the ranger verifies you have done everything correctly he or she will swear you in to the Junior Ranger Program. Once you are sworn in you receive a pin! Finn has been collecting them and adding them to his hat! I will add a picture of his hat in a little bit. I hope you consider getting the National Park Passports and will enjoy them as much as we do! If you already have one, please comment with your favorite National Park you have visited so far! One of our favorites was the Perry's Victory and International Peace Memorial in Put-In-Bay.